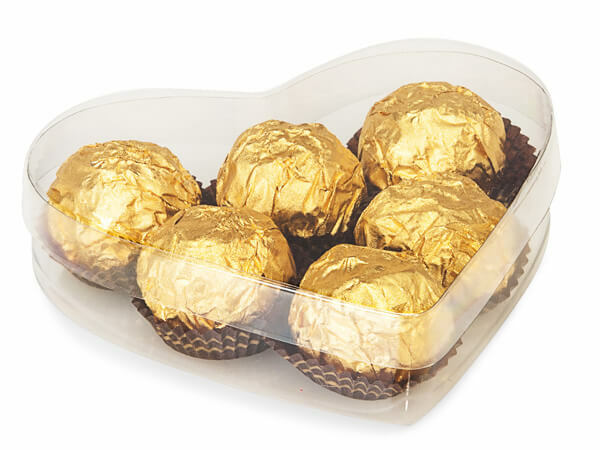 X-Large clear heart favor boxes are pre-formed, 2 piece boxes. They make a great treat box for small wrapped treats, or to hold larger jewelry. These boxes make a great addition to a gift basket, or as a Wedding favor. Boxes are made of PVC. Usable space at widest point is 4-3/4", from center dip of heart to bottom tip is 3-3/4". Display and Favor boxes are uniquely shaped boxes, perfect for party favors! Boxes available in a variety of shapes and sizes. Some display boxes are available with gold bases. Some assembly required. These boxes are great for wrapped candies, party favors or other small gifts. We recommend a food safe barrier such as clear cello. Made in China.